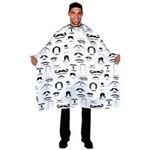 Among the most important hair dressing supplies in a salon or barber shop are hair capes, client gowns and stylist shirts. Choose one of the many water resistant and durable gowns from Source One Beauty to protect both the outfit of your customers and the stylist as well from cuts, colors, trims and other hair products. All of our client and stylist gowns are one size fit all with comfortable client coverage. Select a hair cutting cape or a salon robe that will complement the services you offer at you salon or shop.